With yet another day of exploration and yes, maybe even some fishing, I planned to explore a new area, stop by an outdoor store I wanted to check out, and drive up a canyon looking for trout. 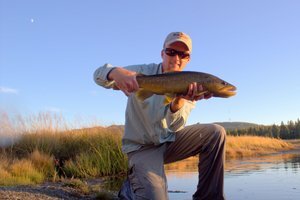 There are numerous fishing opportunities along the front range here in Colorado that also happen to be a reasonable distance away for me. Boulder and South Boulder Creeks, the various forks of the St. Vrain, the Big Thompson, the Cache la Poudre, and Clear Creek. Now, with a name like "Clear Creek," you would assume that the water would be,well, clear. Since my destination was indeed Clear Creek above Golden, I was able to do a first-hand investigation into Clear Creek and what I found was intriguing on many levels. The day started with a leisurely breakfast of biscuits and gravy and scrambled eggs. Fresh raspberries and strawberries added color and flavor not to mention the feeling that I was at least somewhat healthy. After eating as well as much debate, we headed west to catch high 93 south to Golden. I wanted to visit a cool outdoor store, called the Bent Gate, owned by a new friend out here in Colorado. They carry a nice selection of outdoor gear including climbing, backpacking, skiing and snowboarding equipment and all in a store with a great personality. I'll definitely be back when I need new gear! Leaving Bent Gate, we headed up Clear Creek Canyon. The majority of the river is public land which is great as a fisherman since I could fish just about anywhere on the river. Not too far into the canyon, I noticed a deep run cutting up against a rock face. Visions of big trout brought the car to a quick stop and soon I was tossing a #10 Crawbugger with a #14 Mustard John trailer. Noticing a nice fish rising in the shade of the far bank, I tossed the rig over that way. Carefully working the water brought no sign of the trout, convincing me that my first instinct of tying on a BWO was probably the correct one. By this time, I was noticing fairly good numbers of BWOs both sailing downstream and flying around as well. The rising trout were remarkably absent however. Deciding that perhaps a BWO nymph would produce better, I switched my rig around with a hot wire caddis pupa soft hackle I tie with a little dark #18 BWO nymph dropped behind that is a cross between the RS2 and a Barr Emerger. Working upstream, I soon found a deep pocket that just looked fishy. On the second drift, my line stopped and I set the hook into a leaping trout. It turned out to be a beautiful little rainbow that was nice to catch since my research indicated that rainbows were not very common through this stretch of river. Deciding to explore some more, I guided the car on up the canyon. There were large numbers of people out enjoying the day. Some were fishing, but many were picnicking, climbing, and even panning or sluicing for gold! That's right, apparently Clear Creek is open to prospecting for the most part and many people were out enjoying the day while looking for gold. This explained the slightly cloudy water I encountered at my first stop downstream because the water higher in the creek was truly clear as is fitting. Reaching the upstream limit of my exploration goal, I turned around and began to drive slowly back down the river while carefully examining the water for that one spot that I hoped would produce a memorable fishing experience. Finally, I noticed two large pools in a steep section with difficult access. Immediately downstream, a nice pullout offered stream access. I just needed to rock hop a hundred yards upstream to be on some prime water. I warmed up right by the car and finally added a little brown on the caddis pattern. It was tucked up under a rock and came out to hammer the fly. Pictures of the fish led to pictures of the stream. The water almost had an aqua tint although that may have been my imagination. Probing a deep plunge pool resulted in two missed strikes and a spooked 6 inch brown. Looking upstream, I realized that if I was going to fish the water I wanted to, I had best make my way to the pool. Approaching the pool while hitting only the prime pockets on the way up, I remembered something important. 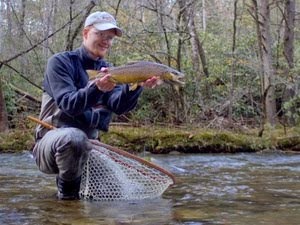 Back in Tennessee, nice fish are often in the first riffle or run immediately below and above the prime hole as those places are prime feeding zones for fish that normally reside in the safety of the deeper water nearby. I carefully approached a small non-descript run that had one dark hole near the back with large rocks around it. Perfect ambush spot for a brown. Tossing the two fly rig just above a small brown came out of the very back of the run to take the caddis pattern. A holding lie that good must have a better fish. Tossing my flies back in to the very top of the riffle so they could drift through the deep slot, I felt a satisfying jolt. Attached to the best fish of the afternoon, I carefully guided it into the shallows where I could corral it for a quick picture. After watching the fish disappear, I glanced upstream. A rise. Then I saw another and another. This pool was shaded by the high canyon walls and BWOs were hatching surprisingly well for this early in the fall, but it is fall now. Lengthening my leader to end in 6x tippet, I found a sparsely tied #18 BWO Sparkle dun, left over from a trip long ago. You know what I'm talking about; one of those flies you really don't remember when it was placed in your fly box but you do know it will catch fish. Soon I was casting to rising brown trout. In the shadow of that canyon, along a busy highway, I found fly fishing paradise if only for 30 minutes. Trout would willing rise, just as long as the fly did not drag, and there were enough tricky micro currents to keep things interesting. Some fish would rise soooo slowly only to refuse at the last second. Others would appear out of nowhere to smash the fly before something larger got to it. Finally the bite seemed to be winding down. I had either stung, landed, or spooked somewhere north of 15 trout. Not bad for a little local river. Heading back down the canyon, I was tempted to explore further, but after fishing to rising trout in my own pool, I figured it might be a little greedy to push my luck any further. Satisfied with a great afternoon, I headed home to find something for supper. Fall is my favorite fishing season with spring a close second. Late February through May brings some of the year's best fishing for panfish in Tennessee. 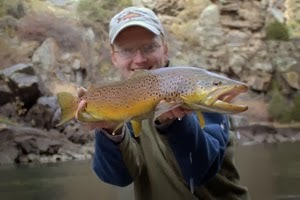 Here is a short video I put together using footage from this past spring's fishing. For best viewing and those with fast connections, make sure you are watching in full 1080p HD. While fairly settled in my new residence and enjoying everything Colorado has to offer, I still remember what I will always consider home. Looking through my pictures I came across this one taken on an evening walk earlier this summer. The storm clouds were catching the last bit of sunlight and exploding in brilliance that no photo can do justice to. This picture reminds me of at least one reason why I like Tennessee so much. Meadow streams are my favorite, well, other than big tailwaters with big trout, but then there are small mountain streams, or how about mountain lakes? I guess I really just like to fish, but seriously, fishing meadow streams for brown trout is high on my list of favorites. Its a game of stealth, meaning I have to be on top of my game because the fish are not forgiving to blown casts or heavy footsteps. Last Sunday was a perfect day for meadow fishing. I was able to explore some new water for the first time and chase big browns all at the same time. What more can you ask for? The day was bright and sunny, definitely challenging conditions but one of my favorites due to my style of fishing. When I arrived at the stream, I messed around near the car for just a few casts to get my muscles warmed up and ready for the challenge. Walking up the meadow to really begin fishing, I passed another angler. We exchanged the usual pleasantries before he mentioned that the fishing was slow and he had been unable to get any to eat. Oh well, I know ways around that problem. Moving up through the meadow, I started on a section of water without anyone else around. Before long, I approached a good looking undercut bank. 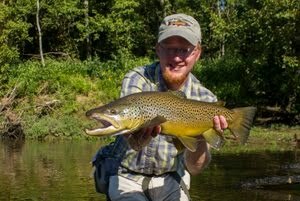 The cast was spot-on and a nice little brown shot out from under the bank to inhale the fly. I was fishing my 9' 5 weight for the extra reach and backbone in case I stuck a pig. Just upstream, a slightly larger fish hit. I paused long enough for a quick shot to help me remember the beautiful colors. Later, a truly big fish in the 22"-24" range moseyed out to investigate my fly before fading into the deepest part of the pool to sulk on the bottom. These are the fish that keep me going back to meadow streams. Rarely seen, its even more rare to actually hook one. Optimism will keep me going back though. Hopefully I'll be on the water again this next weekend. I'm tempted by the high country lakes but those browns are calling as well. So many options but never enough time!!! Saturday evening found me strolling around some ponds with camera in hand. The sun was dropping behind the mountains and the sky was turning beautiful colors. I am blessed to live in such a beautiful place! The short season appears to be close to ending already. A cool storm system has been affecting Colorado since yesterday. According to the National Weather Service, snow levels may drop enough for some high elevation snow today into tomorrow. The chances to fish high country lakes are quickly dwindling, but last weekend I explored a new area and saw some nice cutthroat while I was out and about. The day started a lot later than intended, leaving a little after 11:00 in the morning would normally be a problem due to high country afternoon thunderstorms, but a large area of high pressure was forecast to hold on for one more day, keeping the showers and storms at bay. The trailhead was crowded and finding parking was definitely not guaranteed. Thankfully, after a couple of tours of the parking lot and surrounding roadside pullouts, a spot opened up and we were soon on the trail. For those that fish the area regularly, I'm sure the pictures will give away the location. For the rest of you, I'll just say that the trail started at around 11,000 feet above sea level and we topped out around 12,000 feet above sea level. Our destination was a high country lake rumored to hold cutthroat. I was not too confident since we would be arriving in the middle of the day. Lake fish are notoriously spooky during periods of bright light, but the chance to explore still made the day worthwhile regardless of how the fishing turned out. About a mile up the trail, we passed a lake that had several fly fishermen wading the shallows in search of trout. Just above, the trail steepened noticeably as it climbed towards tree line. Unaccustomed to the thin air, we finally stopped for a break to catch our breath and drink some water. Noticing the scenery around us, the cameras came out. No longer focused on the uphill trek, we could enjoy the incredible views opening up around us. Continuing uphill, the trees shrank smaller and smaller yet until above us there were no more. Every rise above us brought hope that we were approaching the end of our climb. Finally, our final destination seemed obvious and we crested the last rise to a gorgeous alpine lake. Lunch on the lake shore took up the next 30 minutes but then it was time for two more important tasks: fishing and exploring. I had brought a 9' 4 weight fast action rod anticipating the possible wind. The only line in my arsenal for this rod is a floating line, but I yearned for an intermediate or sinking line. The fish were obviously NOT cruising the banks although one nice cutthroat spooked from the outlet as I walked by. Finally, without even a tap on the end of my line, I switched to the second activity, exploring. Climbing high above the lake, the views continued to open up. The high plains stretched out far below but it was our immediate surroundings that kept us looking around with our cameras for the next interesting picture. Closer at hand, the wild critters would occasionally make themselves known. Can you find the marmot in these pictures? Returning back to the level of the lake, I started casting again. Changing to a scud and a midge with some weight to get it down, I started casting out and s - l - o - w - l - y retrieving the setup back over the shelf and through the shallows. After several fruitless casts, I was almost to move on when a sharp tap on the end of my line reinvigorated me. The fish were there, just not very plentiful and not close to shore. Moving on around the lake, I started to think more about that fish in the outlet. With the proper approach and presentation, surely I could catch the nice cutt. Sneaking closer, I discovered that the fish had indeed returned to its observation point. Crouching nearby, I raised the rod tip and as the flies sailed towards the fish, it ghosted slowly into the depths, clearly concerned by the movement overhead. A few more fruitless casts convinced me that I might better spend my time hiking out before darkness came. Heading back down the trail, I started to realize how tired I was. Thoughts of fish started to fade as I considered the nice bed waiting for me at home. Then, as I rounded a corner above a shallow puddle to small to even name, something caught my eye. Rising trout?!?!? Sure that the small pond was too shallow for fish to winter in, I had written it off earlier in the day but now, unless my eyes were deceiving me, trout were rising with abandon. Moving quickly down the slope from the trail to the ring of willows surrounding the water, I found a narrow opening through the vegetation and was soon standing on a rock with only a good cast between me and the rising trout. Were they brookies? The rises sure looked like it, but then I kind of hoped that the brookies had not moved this high up the drainage. Tiredness evaporated and all thoughts of sleep left me as I started to cast. It only took two casts before I had my first fish on. "Not brookies, cutthroat," I happily noted. Small but beautiful, I almost took out the camera. Instead, I decided to set my sights a bit higher. "That rise over there looks like a good fish" I thought to myself. Casting the same set up, I only managed a couple of strips before the fish hammered the fly. Slowly fighting the fish, I decided that this one would have its picture taken. A short time later, I released yet another beautiful cutthroat. What a day it had been! Yesterday, business took me over to Boulder. Of course, it was only another 5 minutes to the lower end of Boulder Canyon so I decided to take the fly rod along (it really was a no-brainer!!!). Arriving streamside around 7:00, I knew the light would fast be fading. The resident browns were at their most gullible as the low light not only made it hard for me to see my fly, but also made it harder for the fish to spot me. In probably the second or third pocket that I fished, the first small brown struck. 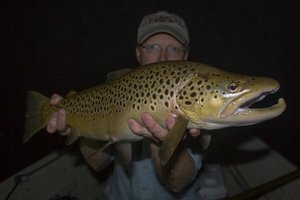 I was fishing my favorite 8' 4 weight with one of my favorite nymphs for Colorado, the Mustard John. The little guy was momentarily airborn when I set a bit harder than necessary. Continuing up the creek, I received one half-hearted tap on the nymph and decided to try a dry. Out came the Yellow Neversink Caddis and almost immediately I had a fish hit. Continuing up the creek in the fading light, I pulled little brown trout out of only the deepest and darkest of pockets as the fish are all on high alert with the low water levels. My best fish came from a very predictable deep dark hole and paused long enough for a photograph. It was a classically beautiful little brown. Soon I intend to venture further afield in search of some larger browns. In the meantime, this is not a bad way to spend 45 minutes!!! Warm nights are still the norm here on the plains. High in the mountains the trees are hinting at the cool nights ahead. Pockets of aspen in the highest elevations are turning golden yellow, splashing their brilliant colors across the slopes just below tree line. Back in Tennessee, colors would start changing by late September, but even here on the plains I'm higher above sea level than everything except the highest elevations in the Smokies. Winter comes earlier here, and I'm intent on enjoying the mountains before the snow flies. The beginning of fall is here, never mind that it does not officially start for another couple of weeks. Last Sunday I hit a high country trail. In addition to the brook trout coloring up for the spawn and heading upstream, the trees were proclaiming the changing seasons as well. The streams are low and clear and the late afternoon storms are definitely on the decline as the monsoon slowly winds down. Fish are hungry, putting on as much weight as possible before ice takes over the streams and lakes. As a fisherman, I love this time of year, likely because I feel like quite the pro when fishing for such hungry and aggressive fish. On Sunday, I only made minimal progress up the trail before the stream was calling me. That's one benefit of exploring a new area. Instead of doing the smart thing and heading far upstream, you can ignorantly fish wherever there is water. In my case, ignorance was bliss. The brook trout were hungry and coloring up for the spawn. Brook trout are probably not more beautiful at any other time of year. The next two months is the time to catch them, not to mention all the other hungry fish out there. As the trail and stream nearly merged into one, I had a front row seat and soon decided to jump in instead of carrying on as a specter. The first thing I saw was a nice 8 inch brook trout that casually refused just about everything I tossed at it. In faster water, a fish rose to the buggy Parachute Adams, and I was soon admiring my first fish of the day. I snapped a picture and then remembered a fishtail picture for my buddy David Perry. Moving up through the steep pocket water, I managed a fish from nearly every deep pocket and some of the smaller less obvious spots as well. In one wide pool a chunky and colored up male rose from the deepest water to inhale my fly. My excitement level shot through the roof as I saw the colors. I dug out the camera and snapped a couple of pictures. Another picture documented the little non-descript run that the big brookie rose from. I suspect it had moved up from the deeper pool immediately downstream, but maybe it lives in the flat run year round. Glancing up, I saw the beginning of fall broadcasting on the stream bank. Eight years ago, I was in Arizona for the fall and while exploring the White Mountains, I fell in love with aspen dressed up in their fall colors. My camera was still out, and after finishing with the aspen picture, I looked upstream and decided to continue taking pictures. Every corner turned begged for another picture. The beauty of this place was just incredible. Moving upstream, I found some more willing brook trout. The average size continued to be excellent and I found two more larger males sporting their spawning colors and some intimidating teeth. Like a kid in a candy store, I was excited to discover what each new pocket and pool held. The brookies seemed to just grow in size as I progressed upstream. The lower portion of this stream follows a road and the average size of the fish I caught there was probably a couple of inches shorter than it was along the trail. Finally, I decided to scratch my wandering itch and climbed out of the stream to hit the trail. Looking up I spotted large patches of aspen turning gold high above. After snapping a couple of pictures of the stream I had just left as well as the colors on the mountain, I was ready to head upstream. Crossing the first bridge over the creek, I stopped to photograph the brook trout jumping the falls. Another half mile up the trail I discovered a sign suggesting that I might find Greenback cutthroat nearby. Glancing around, I saw a little pool beside the trail with a fish finning that looked different from the brookies I had been finding. On the first cast the fish rose and I soon had my first Greenback!!! A nearby cascade suggested pristine Greenback water above so up the high I went. Before long, however, I became more interested in the scenery than catching fish. The views opened up quickly and the cascades itself was stunning. Absorbed in taking pictures, I didn't forget to catch another Greenback. After following gravity back down hill, I found a few more willing cutts before deciding it was time to head back to the car for lunch. By three in the afternoon, I get pretty hungry even when thoroughly distracted by the spectacular fishing and great scenery.